David is joined by Khaled Hosseini, the best-selling author of The Kite Runner and A Thousand Splendid Suns, to chat about his latest book And The Mountains Echoed. This book explores the many ways in which families nurture, wound, betray, honor, and sacrifice for one another; and how often we are surprised by the actions of those closest to us, at the times that matter most. 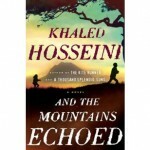 While most of his books have focused on his birthplace of Afghanistan, And The Mountains echoed follows families from Paris to Kabul to San Francisco and places beyond.